We are fully approved activity providers of The Duke of Edinburgh’s Award residential courses, and our fantastic 5-day courses give students the skills and confidence to cook healthy, delicious food for life. We are fully approved activity providers of The Duke of Edinburgh’s Award residential courses, and our fantastic 5-day courses give students skills and confidence to cook healthy, delicious food for life. Each day is dedicated to food suited to a student budget and covers fish, meat, vegetables, pasta, rice, puddings, bread, biscuits and cakes.  The courses are true confidence and team building experiences, with small classes of no more than 12 young people working in a stunning kitchen with professional tutors. Our location means all the historical, cultural and leisure offers of our world renown city is there for students to enjoy. The course includes fun evening activities ranging from Treasure Hunts around historical Cambridge to cycle picnics and bowling. These are compulsory for DofE participants and optional and open to all students participating in the residential package. Our residential package includes accommodation at Homerton college which is located next door to Cambridge Cookery School. For DofE Gold award students the residential package is compulsory. For all other students the residential element is optional. Each day includes breakfast, elevenses, lunch, afternoon tea and dinner and students will not require any additional meals. We are a fully approved activity provider for DofE residential courses. Our fantastic 5-day course gives students skills and confidence to cook healthy delicious food for life. Each day is dedicated to food suited to a student budget and covers fish, meat, vegetables, pasta, rice, pulses, puddings, bread, biscuits and cakes. 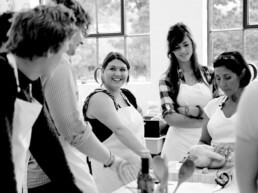 The course puts in place skills for life and encourages an interest in cooking by building confidence. 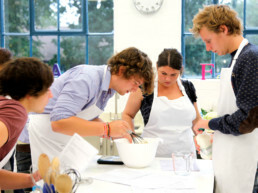 Students work in small classes in a stunning kitchen with a high ratio of tutors to students. Our location means that we can offer students a taste of Cambridge and our DofE evening activities include punting and a walk around historical Cambridge. These are compulsory for DofE participants only. For DofE Residential participants the residential package is compulsory. Students stay across the road from us in Homerton college rooms, and get a little taste of being a Cambridge student. 24/7 Porter service and double lock security. Students stay in single rooms and share a corridor.  A fully qualified member of our team also stays in a room in the corridor for added security.